OUR PRICE: $36.97 - Join Rewards Get $3 Dance Dollars On This Item! The perfect shoe for clogging or tapping in quality man-made uppers. Constructed for comfort and durability with a reinforced top line, box toe, counter support, terry lining, cushioned insole and durable outsole. Taps are not included. Held up for 5 years and counting! I've danced in these shoes for 5 years and they have held up! They are wood soled, so no need to pay to add wooden taps. Great sound without overpowering musicians. I dance Irish Sean-nos and Appalachian Flatfooting and they are great for both. I recommend them to all dancer friends. Bonus - great price and cruelty free! After three tries I found this shoe which I used for Irish set dancing for the first time yesterday 2.18.18. I first ordered them on Amazon size 7.5 my street size. The reviews were conflicting as to sizing. Too small returned them. Ordered 8.0, too small returned them. Amazon did not have 8.5 jumped to 9. I searched the shoe online and found 8.5 here. They fit perfectly, and were comfortable after a couple hours dancing. I found that these shoes worked well for flat-footing. I didn't want to invest a lot of money since I was just learning. I needed a smooth bottom shoe that I could slide on my half inch plywood raised dance board. The heel made a decent sound and they didn't hurt my feet after 4 hours. Taps would have been too loud and annoying to the other musicians. I haven't owned them long enough to comment on the durability but they seemed like they would hold up. Do these come in men's sizes, for example a men10.5 W? Hello! Thank you for contacting us. These shoes can be ordered for men by going up 2 sizes from the street size. 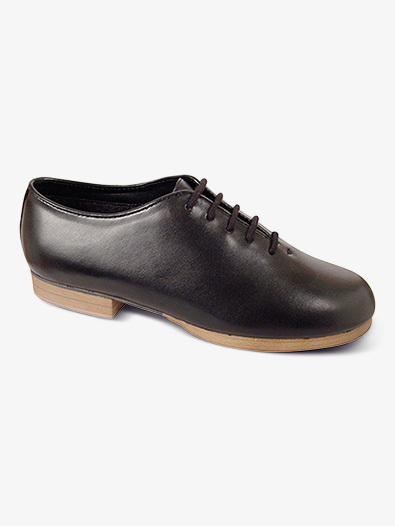 Where can I find taps to fit this clogging oxford? I am interested in purchasing these shoes, but I need taps for tap class. We sell the clogging shoes but not the clogging taps. What is the size difference for men? Should I order 2 sizes above the women's size? Men need to order two sizes larger than their street shoe size. Is ordering size different for a boy? If the child wears larger than a 4.0 child's size you would need to order up to the adult version. Do these have hard wooden bottoms? And they are totally synthetic (no leather or suede)? The bottom soles would be wood. The inside does have suede.